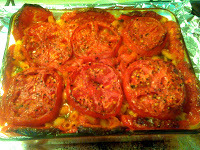 I didn’t make this up, it’s an Italian thing… But all I had was my memory of seeing someone make it on TV a while back to get me through the recipe so I guess this is my take on Pasta alla Formiana… I’m still trying to find new ways to use up all these garden veggies (tomatoes in particular) so this was a really great way to do that. It’s really a very cool recipe- you’re baking uncooked pasta in tomato sauce, in a baking dish lined with raw tomatoes. It’s such a great concept! The finished product ends up tasting pretty much like any great tomato-sauced pasta dish but it’s the method and presentation that allows this to stand out in a crowd. Here’s what I did..and I urge you to follow my baking notes so your smoke alarm doesn’t scare your child. 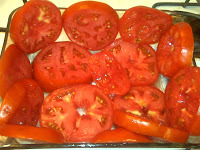 You can either puree 1 28oz can of whole tomatoes or cook your own tomatoes and peel them like I did, (did I mention I have a ba-zillion tomatoes?). But either way you do it, you need 28 ounces of tomato product. Place that in your food processor with 1 large clove of raw garlic and puree until completely smooth. 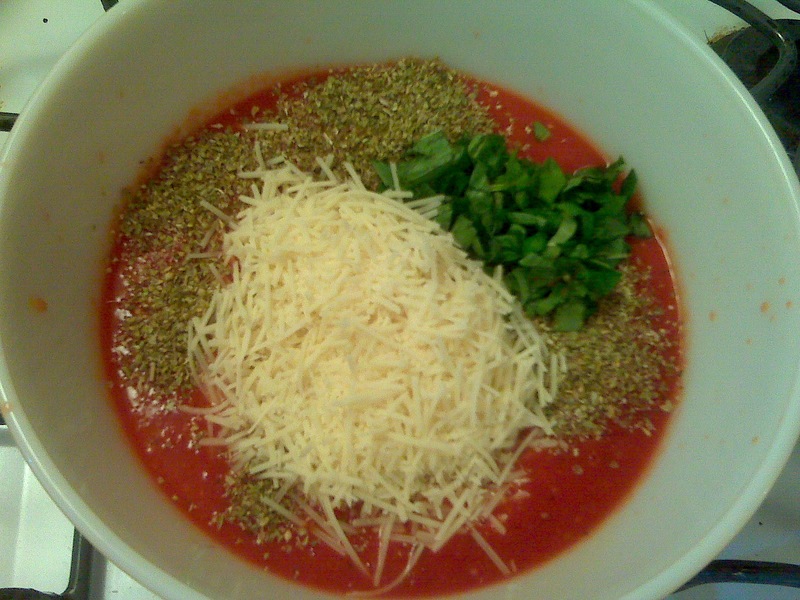 Pour that into a large bowl and add several TB’s of oregano, a handful of minced, fresh basil, 3 ounces of grated Asiago or Parm cheese, a pinch of crushed red pepper flakes and a few pinches of salt and pepper to taste. Stir and add to that 1/2 lb. 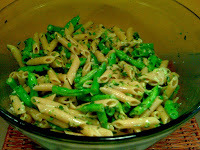 of any short-cut, whole wheat pasta (I used penne, and the whole wheat is essential unless you want mushy pasta…) and about 1/3 cup of extra virgin olive oil (yes that is a lot of oil for one of my recipes but it really needs it). Set aside. Butter a deep 9*9in glass baking dish and line it with thick slices of large, fresh tomatoes. Line the bottom and up all the sides. Place your glass dish on a foil-lined cookie sheet (*this is that important no-smoke alarm part) and bake in a pre-heated 450* oven for 1 hour. 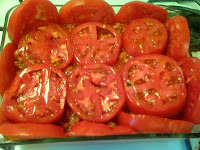 Remove from the oven and allow to cool just as you would a lasagna before serving. 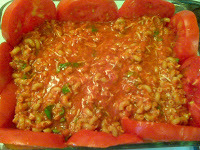 The pasta cooks and soaks up all the tomato sauce and the raw tomatoes become adorably shrively on top. I think next time I’ll top it with a layer of fresh mozzarella half way through the cooking time…a nice goo-factor would be nice here. But garnish with more grated cheese and basil if you’d like. Enjoy! I LOVE pasta, for my sins, and this looks like a great way to do it. Amazing oven temperature, OF COURSE; I'll definitely wait until it's cooler to try it! I am VERY jealous of your tomatoes. But ours are coming soon! I love pasta too, always have. All starches are favorites of mine! And all of these tomatoes were from my moms garden and I think it's a mutant-from outer space-garden.